A number of commenters to IM this week have struggled with our interpretation that the story of the fall and its consequences does not indicate a radical change in the nature of creation itself as the result of human sin. If, BEFORE THE FALLâ€”plants and organisms decayed, if carnivorous animals ate other animals, if earthquakes shook the land, if meteors crashed onto the earth’s surface, if entire species died out and became extinct, if bacteria and viruses caused illnesses and suffering, if accidents occurred, causing injury and pain, if ancestors of humanity and perhaps even other human beings on the earth before Adam and Eve lived and experienced the vicissitudes of life and then died, if as Tennyson famously wrote, nature was “red in tooth and claw,” even at the beginning, then doesn’t that undermine the teaching of Scriptureâ€”that all these evils are to be attributed to the fall of humankind and the entrance of sin into the world? The story of the six days of “creation” begins with the world already present, covered in darkness and watery chaos. This negative state is hostile to life. The Hebrew words “tÃ´hu wÄbÅhÃ»” (formless and void) indicate a trackless wilderness, an inhospitable environment incapable of sustaining a “good” existence. In his commentary on Genesis, Bruce Waltke elucidates the theological implications of this. This negative state at the beginning of creation indicates the presence of “surd evil”â€”evil that is incapable of rational explanation on our part. The origin of this evil has not been revealed to us. It is not dualistic, eternally existing and co-equal with God, for the Bible makes clear that it operates only under his sovereign control. Nevertheless, we see it operating in the world before human sin. One main point of the creation account in Genesis 1 is to show how God brought order to a chaotic earth and made it habitable for his creatures and humans. He turned tÃ´hu wÄbÅhÃ» into tÃ´b (good). “All is bounded by God’s control” (Waltke, p. 69). Surd evil was present before human sin, and continues in the world under the providential oversight of God until the day it too will be swallowed up in new creation. Another indication that there is more to evil in the world than that which results from the fall is found in Genesis 3, before the account of human sin. Before Adam and Eve take their first bite of forbidden fruit, the author introduces us to the serpent. I don’t think Moses had anything against snakes in particular, although forty years in the desert might have given him an aversion to them. The text suggests that there was a Dark Power behind this serpent. Animals don’t talk in the Bible unless some spiritual personage gets hold of them and makes use of their tongues. From whence did this Dark Power come? Does not his very presence, his questioning of God’s character and words, his active role in tempting Adam and Eve to disobey God, testify to the fact that all was not right in the world even before human sin? One of the ways the Old Testament describes creation is through a conflict between Yahweh and the sea (or â€œwatersâ€ or one of the sea monsters, Leviathan or Rahab). Sea is a symbol of chaos, and so Yahwehâ€™s victory in the conflict establishes order. He is the creator, the supreme power. Israelâ€™s proper response is awe and praise. God did not just “separate” the daughters, he rebuked them and they fled to their appointed locations. This pictures God and “the waters” in conflict with one another, and God putting them in their place. O LORD God of hosts, who is like You, O mighty LORD? Our Creator is the one who rules over the seas, stilling them, and crushing the enemy forces of chaos that exists within them, here called Rahab, the great sea monster. Who works deeds of deliverance in the midst of the earth. Note how God’s creation acts are described as “deeds of salvation (deliverance)”! 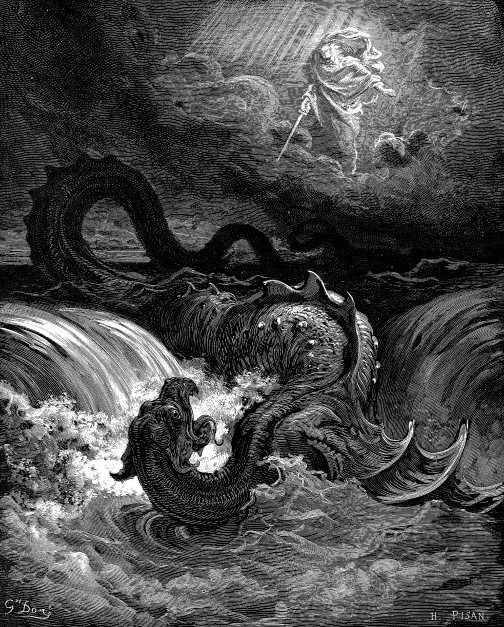 It took his “strength” to divide the waters, which involved breaking “the heads of the sea monsters in the waters” and crushing “the heads of Leviathan.” Note also how the emphasis of the text is bring order out of chaos, of “establishing boundaries,” thus organizing his creation so that it is “good” for his creatures. Who determined its measurementsâ€”surely you know! See also Job 41, where God graphically describes the power of Leviathian: “Who can confront it and be safe? Under the whole heaven, who?” (Job 41:11). God the almighty Creator, that’s who! He and he alone is able to thwart the forces of chaos, command the raging sea into its place, and tame the wild beasts of the sea that foment disarray and destruction. Is this “cosmic battle” emphasis seen in Genesis 1, the foundational account of creation? Yes, there are at least a few indications that this “cosmic battle” against the sea and Leviathan inform Genesis 1 in one way or another. We’ve already discussed how the negative state described in 1:2 suggests a creation in which surd evil is present even before the fall. In verses 20-21, note now God mentions only one specific creature in sky and seasâ€”the great sea creatures. This may be read as a subtle polemic against Babylonian myths representing these sea monsters as great powers that the Babylonian gods had to defeat in order to achieve victory. In contrast, the one living and true God, creator of land, sea, and skies, simply brought forth these creatures and populated the seas with them. They are mere works of his hand. What does this “cosmic battle” emphasis say to our subject? It says that the Bible portrays the presence of forces and powers opposed to God active in the universe and in the world before the first act of human sin. God had to perform “acts of salvation” (Ps 74:12) even to create the world! In creation, he delivered the world from conditions of chaos and disorder, bringing order and “goodness” to it, so that his creatures could live in his blessing. Those forces are still present, but they are kept within the boundaries that God’s sovereign, providential rule has established. Human sin did not introduce all forms of evil and chaos into the world, but it did intensify them. Human beings, who were called to exercise dominion over the world, have become corrupted, and under their rule the world sinks even deeper into chaos. Acting out in a world where surd evil often rears its ugly head, voluntarily in league with the Evil One who first tempted them to sin, aligning themselves and cooperating with the cosmic forces opposed to God’s rule and righteousness, sinful human beings threaten to turn tÃ´b (good) back into tÃ´hu wÄbÅhÃ» (an uninhabitable wasteland). This effort shall not prevail. Our hope is in God, who in Christ is making a new creation. This view of God versus chaos and the idea of sin intensifying chaos (what is sometimes called evil) is fascinating in light of how humans approach their world. Dogs are a good example. In the heat of the day, they are not at content with the choas of nature and attempt to alter it, to master, for their comfort, by clawing at the ground, destroying grass and vegetation to get at the cool dirt underneath. As a higher animal, humans take this to the next level. They construct shelters and devise technology like air conditioning in an attempt to master the natural chaos that makes them uncomfortable and sometimes even threatens them. Christians call this discomfort “evil” and put out calls for some sort of deliverance from a concept called sin when in truth, this is simply a natural part of the process of life. Humans remain simply animals altering, and even destroying, nature in an effort to find creature comfort. The fact that biblical narratives align with the realities of life in their imagry make them amazing pieces of literature. They show that the authors, though primitive, had a decent grasp of the reality of human existence. There is also the fall of the rebel angels to take into account. Before the humans are created, there is already discord in creation due to the disobedience and pride of Lucifer. And, if we take as a metaphor for what this first fall brought about, the mediaeval notion of cosmology that the angels act as the intelligences of the planetary spheres, distribuing and mediating the influences in creation that emanate from God, then that may be one element of the “surd evil” – the wound in the created order due to the self-will and turning away of those who should be its guardians and guides. C.S. Lewis explored this idea in ‘Out of the Silent Planet.’ Earth’s governing angel became corrupt, and corrupted all the planet with him, necessitating a cosmic quarantine. And we poor humans are stuck here, not innocent, but not entirely guilty for the dark and silent planet we inhabit. And Tolkien, of course, was all over this idea in the ‘Silmarillion.’ His is the best description. I’ve been thinking recently along the lines of the role that human beings were supposed to play within God’s world, and I tend to think that Romans 8 indicates a long, “frustrated” delay due to Adam and Eve dropping the ball, so to speak. So perhaps it’s not just an intensification of evil (a direct curse from sins committed), but the inevitable “natural” effect of our ancestors rebelling against God’s purpose for them at the start of a world that was chaotic beyond the garden (so they didn’t fulfill their priestly roles in subduing the chaotic world). I may be off with that somehow, but it seems to me that Adam and Eve’s failure doesn’t function properly within the story unless nature is itself wild and dangerous. What an awesome responsibility and potential they had. Thanks be to God that their/our failure was not the end. Interesting. It does put the whole naming of the creatures and keeping of the Garden in a new light. You have (mostly) convinced me the picture of God you paint is not one contrary to the God of the Bible. However, it is still a very different picture. The YEC envisions a God who knows the end from the beginning, who boldly goes forth and does what He plans. From Adam to Noah is 1500 years (about 10 generations), from Noah to Jesus we have 2500 (many more generations, but well covered by written history). This gives us assurance that the 2000 years since brings us close to His return. At every turn, the Enemy’s most clever plans are foiled and turned to reveal God’s glorious plan. The OE pictures a God who creates, but in the course of the 14 billion years from creation to man, Satan gets in and messes everything up. God tries to create good, but everything turns out bad. God tries to grab a toehold in Eden (among the first humans, perhaps 1e6 ya), but that is a disastrous failure. The descendants of Adam are even more failures, and God nukes the site from orbit. Over the next 997000 years, God is quiet. Then, God reveals Himself to Abram. And we follow from there. Perhaps Jesus will return soon, perhaps He will wait another 15e9 years. I hear what you are saying, nedbrek. But I wonder if even the “YEC God” is really as simple as you have described. Your main objection seems to be the vast periods of time, but apart from that, one is left with the same basic questions about God’s ability to rule his world in the face of evil. Someone who is predisposed to object to God’s goodness in the light of suffering and delay will have (and has had) as much problem with the YEC view of God. I think the large time spans are a problem, as well as animal death before sin. The biggest difference is that I can explain evil as being due to human sin, while the OE view places a fairly large emphasis on Satan’s sin (all the evil before the Fall). I just don’t see that big of an emphasis on Satan’s sin in the Bible. It is almost an afterthought, where it is mentioned at all. I wish I could remember the title but I read a book once where scholars from different religions were asked to explain the tsunamis in Indonesia. As I recall, the Hindu had an explanation close to your quote above. Basically, if you were killed in the tsunami, it was simply your karma. You were atoning for a sin in this or a prior life. The scales must balance, and you are the cause of your own suffering. I often find Hinduism to be the most logical and reasonable of religions. It just lacks that crucial spark of brilliant absurdity that Christianity has, which makes me feel that it is correct. The problem with Hinduism is that there is no break from the cycle of evil. I face evil for the sins of my past life (which doesn’t seem fair, given that I can’t remember those sins). Someone in this life is chosen to enact the evil upon me, thus guaranteeing more evil in the next cycle. It seems to me that Satan’s sin, or wherever surd evil comes from, would be an afterthought in the Bible even if it were a far bigger deal than human sin, cosmically speaking. We hardly know anything about angels or their fallen counterparts; how can we discuss them in any detail? Besides, the Bible is pretty practical oftentimes. It doesn’t belabor points with no practical goal. And there would be little practical goal in describing the exploits of spiritual entities that existed before humanity lived. Chaplain Mike, this is the first time in the months that I’ve been reading Internet Monk that I have nothing good to say. Your post here is just a bare-assed attempt to preserve Christian orthodoxy at all costs, and it doesn’t deserve any respect. Really? A bare-assed attempt? I thought it was a very convincing argument that takes into consideration the various creation accounts in the Old Testament other than Genesis. In all honesty, I have never heard a convincing explanation of those passages concerning “fighting back the waters” from a YEC perspective. Of course I don’t know why I even responded to this comment, because I expected it will be deleted for its hateful, disrespectful tone (and rightfully so). It’s hard for me to respond when you don’t give anything but bare criticism. Ever wish you could lock Otter & Nedbrek in the same room for a while in the hope they’ll kill each other off? He might kill me, I don’t know him that well. But he would hear the Gospel first. And I’m an OEC with a hint of theistic evolutionist to boot. I have just been reading a book by Charles Foster called: The Selfless Gene: Living with God and Darwin which addresses precisely this issue and I thought did so very well – definitely worth a read. This is very thought-provoking and well thought out. My position is essentially the same as this but there are some very useful things you mention here that hadn’t occurred to me before. I think that God intentionally allows pain and so-called ‘natural evil’ because he anticipated Mankind’s fall and made a world capable of sustaining man in a fallen state. Things like hurricanes, earthquakes, and animal death are all side effects of a world that operates on a continuous cycle necessary for the human race to survive. If the world was static there wouldn’t be natural disasters, for example, but there would also be no rain necessary to grow food. If there was no death, animals wouldn’t die and appear to suffer, but neither could you eat food or do much of anything else based the death and destruction of living cells (cutting down trees for resources or to make room for building houses comes to mind.) I don’t think any of this implicates God as weak or impotent – rather far-sighted and reacting in advance to mankind’s potential to sin. Of course, we didn’t have to experience any of this, but getting kicked out of the Garden clearly put mankind in a tougher world. We must be careful not to shoe horn our own ideas or modern terms into the Biblical text. The Bible clearly says that life is in the blood. Plants, not having blood, are not alive in the Biblical sense. Before the Fall, all animals ate plants. It’s possible that this also applies to creatures with open circulatory systems – so there may have been insect eaters – assuming there even were insects! I believe simpler forms (bacteria, viruses, sharks) may have been created after the Fall (weeds definitely were). I don’t believe God would forward charges against man’s sin. The fallen-ness of the world must be attributable to the sin of man or Satan – else God is creator of evil. Isn’t stating that “weeds were created after the Fall” an example of putting your own idea into the Biblical text? The verse you quote never says that “thorns and thistles” (weeds) had not existed up to this point. It just says that the ground will bring forth thorns and thistles for Adam (in the context of agriculture). So I still argue that saying weeds were created after the Fall is an example of putting your own idea into the Biblical text. It’s funny, I was pulling weeds earlier today. These kind look like something out of “Day of the Triffids” – spiky, juicy. There is something in the spikes, if they even touch you, it is painful and tingling. There is a parasite known as the “Guinea worm” which exists only it humans (it needs a human host to propagate). You can read the description, it is quite terrible. These things are not part of a good creation. Perhaps God is only referring to the garden as good, but I do not believe so. Christians can’t avoid conceding that God knowingly created a universe in which moral agents freely chose evil. Even if we all agree precisely how God would not forward charges of consequences against human sin that would not change the problem Christians have always had that, as Augustin put it, there is no natural efficient cause for the origin of the evil will. We know God is not the author of evil but we cannot be sure what deficiency there was in a creation God declared to be very good that led to evil. The mystery of lawlessness/sin is so great that only a greater mystery, the goodness of God in Christ, is capable of overcoming it. Clearly the disposition toward sin was active in the serpent and latent in humanity prior to the actual Fall. These problems and mysteries are not ameliorated by either the YEC or OEC positions. I understand that OEC makes death pervasive prior to the Fall and that presents some big problems with how the apostles discuss the effects of sin. On the other hand, YEC doesn’t solve any of the problems that it observes in OEC. To propose that sharks and bacteria are postlapsarian creations doesn’t functionally avoid proposing that there is the good creation and the bad creation. It simply yields to ontological dualism beyond the scope of Christian confession at a different place while holding that it has not succumbed to dualism about the nature of creation. If the lion will lie down with the lamb then even those things which could be alleged to be “evil” creations in response to sin will be redeemed, this suggests that the sharks were made after the Fall is not the right path to take. Weeds, yeah, that’s a defensible case but to extend it beyond the plant world is taking a liberty the biblical record does not seem to support. I don’t find it so mysterious. We assume evil is to be avoided at all costs, that this should be God’s purpose and design. However, God’s purpose is to glorify Himself (to express His attributes). Without evil, God’s wrath against sin cannot be demonstrated. Without sinners, there can be no forgiveness. God allows sin and evil because it ultimately glorifies Him. If God allows evil because it ultimately glorifies him, that means either 1) evil is good or at least 2) everything that glorifies God is not good. I appreciate your posts and your point of view. They give me a perspective I haven’t heard until now. thanks. But it seems to me that allowing evil or sin in order to demonstrate your wrath or forgiveness is a little like letting my daughter take drugs or have a baby out of wedlock in order to show her how mad I can get or how much I love her. I am much more of a loving father, IMHO, if I keep her from avoiding that sin or experiencing that evil in the first place. Maybe I am glorified when I show her I still love her even if she’s a junkie, but I would feel more glorified if I never have to cross that bridge. It is #2, all creation glorifies God – but not all creation is good. Only God is good. You have to be careful with parent analogies. God is not exactly like a parent, similar in some ways (or rather, parents are a dim shadow of God). God is not just mad because of sin. Sin is the worst thing you can imagine. Sin brought about the death of Jesus. For God not to punish sin, for there to be no effect from sin – would make God unjust. What is the declaration/display of your anger on the scale of the universe? Very little, close to zero (possibly negative, with regard to your responsibilities as a parent). However, God is the most beautiful thing. The display and declaration of any aspect of Him is very great indeed. … so this means that OEC and YEC both essentially describe God as both planning for and permitting sin, suffering and death as a way to glorify Himself. Interesting. Yes, an all knowing and powerful God must know about sin and not act to prevent it. The alternative is that God was surprised by sin, or unable to prevent it. Yes, but we are not told they *only* ate plants. You’re shoehorning your own ideas into the text here. And isn’t this a description of animals in the Garden, anyway? Is it not at least a possibility that the living conditions for animals in the Garden were different from those in the rest of the world? There is absolutely no evidence or reason to believe that bacteria, viruses, or sharks were created after the fall. This is pure speculation. And none of this is a “forward charge” against Man’s sin but a deliberate and conscious choice on God’s part. It is important to distinguish between evil – which requires the action of a moral agent, such as a human or angel – and suffering, which we perceive when animals eat each other, as well as what we call natural disasters. Nobody complains when a landslide wipes out an uninhabited area, or whenever a river floods an uninhabited region. Or for that matter the incredible violence found in the natural processes of a star, far more terrifying and powerful than anything on earth. These are natural events when they don’t affect people, bringing attention back to the problem of suffering. But I believe God has overriding reasons for allowing these things (the sustainability of humans and other creatures) that we could have avoided, at any rate, by not sinning and getting kicked out of Eden. It follows logically. We don’t have to be told every little thing, we are allowed to use our minds. To kill someone who has not sinned is evil. To slaughter animals without purpose is evil. That should be obvious. The fact we are debating this points to how evolution has twisted our thinking. To slaughter animals without purpose is evil. So what did the birds and animals do to deserve being wiped out with mankind as part of the Genesis 6 flood? What purpose did God have in destroying them other than to assuage His regret at having made the birds and animals? And if there was no other purpose in it, was God’s slaughter of them therefore evil? The creation is subject to man. When man fell, creation was subject to futility. The decay of nature points to sin. It loudly proclaims the sinfulness of sin, and God’s judgment against sin. In fact, it’s not an answer. Ok, the wages of sin is death – no sin, no wages. And the image about half a page down. The imagery of Rahab and Leviathan do run throughout scripture. I have heard it said that this is part of the stories of Jesus calming the storm and walking on water. The disciples were terrified of the supernatural, superstitious forces unleashed in the waves; Jesus by his miracles demonstrated that he holds the same mastery over these forces of chaos. I also like your clarifying term, “YEC god”. I think this really needs more exploration, because my concern is that how we interpret Genesis reveals more about our theology than it does our view of science. As I mentioned before, moralistic, therapeutic deism (MTD) loves theistic evolution. It also could care less if any part of the Christian message – including Jesus – has any basis in history; it can all be a myth, but it can still enlighten us on the path to becoming nice and happy. I don’t think that questioning Genesis places one in the MTD camp, but I sure wouldn’t want this material to be used by them to further their cause. But the theological pitfalls of YEC may not be as easily distinguished. Gnosticism has a lot to say about creation – but in a way that is theologically distinct from orthodox Christianity. Saint John attacked gnostic creationism throughout his writings. I am not aware of any. If you think of some, please let me know. Thanks Chaplain Mike–I appreciate your willingness to take this on and to give it this level of consideration. As you might guess from the intensity of some my comments over this week, this question of pain and suffering in the world is not an academic one, to me; it cuts to the heart of whether there is any meaning or hope in the Christian emphasis on the idea of redemption. But when the question is, where does it come from, you honestly answer, “We don’t know.” We don’t know where evil comes from, while on the one hand we affirm God’s sovereignty over it and at the same time acquit God of being the source of it. (Six impossible things…) He is not responsible for it but he CAN redeem it (so I don’t lose my hope, or the sense that God does actually care about my physical suffering, not just my spiritual side). It’s not as intellectually satisfying a position as it might be, and it definitely requires a lot of leaps of faith. But it’s certainly in keeping with Job, who’s one of the oldest answers to the questions if I remember rightly. I’m not going to say I’m happy with it–introducing massive logical inconsistencies at that level allows for all sorts of weird conclusions–but I may be stuck with it. 😉 Thanks for writing it out. I have to say I’ve really enjoyed “creation week” here at iMonk. As one for whom Hugh Ross was the final nail in the coffin for even remotely considering the YEC position, this has helped me to understand more of the theological underpinnings of theological evolution. And of course we cherry-pick, lifting out two or three passages that support our position out of context and throwing out those that don’t support us. Which, of course, leads to huge arguments when my cherry-picking doesn’t match yours (anyone ever seen a discussion of free will vs. predestination, and how vicious the discussion can get, even on “Christian” boards?). Again, thank you for a discussion with some depth to it, and for a study that was willing to address more than one or two cherry-picked passages. it seems that surd evil could have one of two origins (or perhaps some combination). The first is to attribute it to the fall of Satan. The second (as with Hugh Ross) is to recognize that this universe is subject as part of its very nature to decay and entropy. In the new heavens and new earth there will be new physics, chemistry, and biology and decay and entropy will either be radically changed or done away with. If the second is true, as I believe, then surd evil is a consequence of living in this world. Sin has intensified this evil, especially for human beings, but death and decay have always been part of this creation. I would urge you to read Hugh Ross’ works on this topic. If the YEC view is correct, then the Fall of Adam and Eve involved not just a fall, but a huge new creation and alteration – predators, carnivores, weeds, diseases etc. And all in about 10,000 years! That’s either a lot of creation or very fast evolution. I believe both Alvin Plantiga and Greg Boyd believe that surd evil is a result of supernatural beings acting against God’s will (eg demons/fallen angels). It is interesting that the Bible shows God / Jesus rebuking nature. Yes, the only sort of evolution which has been observed (micro-evolution, changes within kinds) happens very quickly – just look at a St. Bernard and a miniature poodle! In just the last hundred years, many different types of dogs have been produced. Also, chickens have been split into two radically different animals (broilers and brooders). Milk cows compared to aurochs, etc. But I have never found a good explanation for what a kind is- from what I can tell, a kind is greater than a species- house cats, lynx and bobcat might all be in the same kind. Or to use your example, aurochs and modern cattle are vastly different species (to the point of being unable to breed them right before the extinction of the aurochs in 1627). This question is not meant as an insult or as a point of argument, but instead as a point of confusion for me. Part of the issue I have with creationism (from macro- ie. YEC to micro – ie. ID) is lack of central definitions of certain terms. I don’t think we will ever know the full list of kinds (and what species derived from what kinds) – this side of eternity. Noah had 2 of each kind on the ark – they gave rise to the species we see today. Anything other than that has been lost in the sands of time. I’m not asking for a list. After all, new species are being discovered ever day, so any definitive list of species I could give you (assuming I could go through all the relevant journals, etc.) would be out of date in an instant and hopelessly long. The best definition I’ve been able to find for a kind is from Answers in Genesis, which says, to paraphrase them, that kinds can breed with each other and create hybrids, but that the inability to create a hybrid shouldn’t be an indication that two plants/animals/fungi/etc. are not of the same kind. So, can breed is necessary for a kind, but not sufficient. What tops off the size of a kind? How does one go about excluding things from it? I will admit that there are at least two other competing definitions for what a species is and they are being loudly argued about. However, while one definition is ideal, I will take debate about exact definitions over lack of a definition. The contemporary science book definition of specie is not sufficient, nor is it particularly scientific, since we now know many examples of different “species” which have successfully mated-some in captivity, and some in the wild. Wolves (Canis lupus), dingoes (Canis lupus dingo), jackals (Canis aureus, Canis mesomelas, Canis adustus), coyotes (Canis latrans)and domesticated dogs (Canis familiaris), plus several that are extinct. The problem lies in that each of the “species” above can successfully mate with the others, and produce viable (that is, fertile) offspring. Therefore, by the contemporary definition, the taxonomy is wrong; they’re all sub-species or different breeds of dog, and of the same specie. And it’s not just with dogs. Ever heard of a crossbreed between a lion and a tiger, commonly called a liger? It’s not just from Napoleon Dynamite’s drawings; ligers exist (though the jury is still out on breeding them for their skills in magic). My contention is that our definitions are wrong. Instead of a specie being that which can successfully breed with others of the same, in many cases, it should be the genus. What we’ve been calling a specie is really just a genetic gradient due to the environmental adaptation. Note that this is not a case of evolution or Darwin’s speciation; rather, it’s merely specialization, where the genetic diversity of a progenitor-parent is pared down over time to only include those traits that allow creatures to thrive in that place. There is no increase of genetic diversity here, only a decrease. And as you say below, I think this agrees with the definition of kind from Answers in Genesis. Noah’s “two of every kind” were the parent-progenitors of all the diverse species seen today (that is, the different breeds of each kind, specialized for distinct habitats). There’s no evolution here – just specialization. Mr. Eggleston must be an imposter. Such breathtaking ignorance of evolution can only drive YEC believers away from the fold. If you’re going to stick to YEC, then at least do so from an informed position of the actual science, as Todd Wood and Kurt Wise do. I would simply like to also state that Hugh Ross and Reasons to Believe has been of help on this topic. Thanks for this post, Chaplain Mike. Very well done. Of all the questions surrounding this issue, this is the one that I think consistently gets overlooked. I have wondered myself if it is possible to think of the Garden of Eden as an island of paradise within an otherwise chaotic world, and yet it was God’s design for Adam and Eve that they “Edenize” the rest of the world by expanding the borders of Eden until all creation would become ordered under the rule of humanity, the image of God. If so, could that be a kind of covenant of works whereby God promised eternal life to Adam and Eve if they would have kept his commandments? In other words, Eden was an attempt to redeem the Surd Evil-damaged world. Tikkun Olam on a global (and possibly cosmic) scale. Depending on what search engine you use, if you type “surd evil” into it, this post comes up as the fourth or sixth listing. I had never heard that term before, Chaplain Mike.